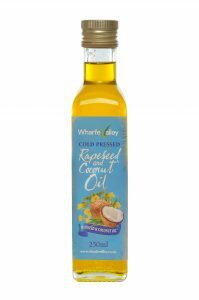 We are very proud to announce that our Whafe Valley Cold Pressed Coconut and Rapeseed oil has been shortlisted in the Veggie Awards 2018 – winners will be announced in their July issue, on sale 28th June. We can’t wait for the result! To celebrate we have included one of our favourite coconut oil recipes. Enjoy! Ingredients: 30g carrot grated, 3 large organic free range eggs, 50g creme fraiche, 160g Wharfe Valley rapeseed and coconut oil, 250g plain wholemeal flour, 1 teaspoon bicarbonate of soda, 1/2 teaspoon freshly grated nutmeg, 1/2 teaspoon salt, 2 heaped teaspoons of cinnamon. Method: Put everything in a mixer for 30 seconds, pour the cake batter in a buttered, lined 20cm cake tin, bake at 180c/350f/gas4, for between 60 mins to 80 mins – until the cake springs back when pressed lightly, then decorate it with a cream cheese. Topping: 1 large unwaxed orange, finely grated zest only. 300g Philadelphia full fat cream , 20g runny honey drizzled over the top of the cake. Share a rapeseed oil recipe with us this month and we’ll send you a free delivery code worth £5 as a thank you! Published on May 1, 2018 by Hayley.